Dynaudio Focus 220 Mk II review | What Hi-Fi? We tested the original version of the Focus 220 back in 2006. They were fine speakers, but lacked a little sparkle. Dynaudio has retuned the bass port, and tidied up the cosmetics a little for this Mk II version. And the changes have worked, producing an unusually competent all-rounder. Like your music loud? No problem, these floorstanders will pound out demanding discs such as The Dark Knight OST with ease. At any remotely sane level they stay calm, composed and refined. The treble refuses to harden up until you're deep into ear-damaging territory. In all but the largest of rooms, volume level isn't going to be a problem. Neither is bass. The distinctive Esotec+ mid/bass drivers can shift a lot of air, and have no problem going really low and keeping a firm grip. There's agility at low frequencies that the original merely hinted at. Add a refined tonal balance and fine integration to the list of plus points and you have speakers equally at home with the likes of Tori Amos as with a Schubert Symphony. Use a recording with natural stereo perspectives and the Dynaudios will respond with a pleasing layering and precision. All in all these are accomplished sonic performers, that we have no doubt many will admire. But admire isn't the same as love. For all their sonic strengths, the 220s don't quite entertain or inspire as they should, particularly at this kind of price. They need a hint of extra expression in the midband, and dynamics with a little more crispness. Timing could be a tad sharper, too. 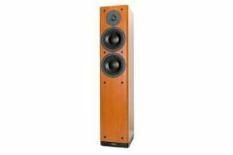 Don't get us wrong, these remain very fine speakers for the money. They're just not special enough to gain that fifth star.